Please note that not every group receives direct cash aid from the Association. 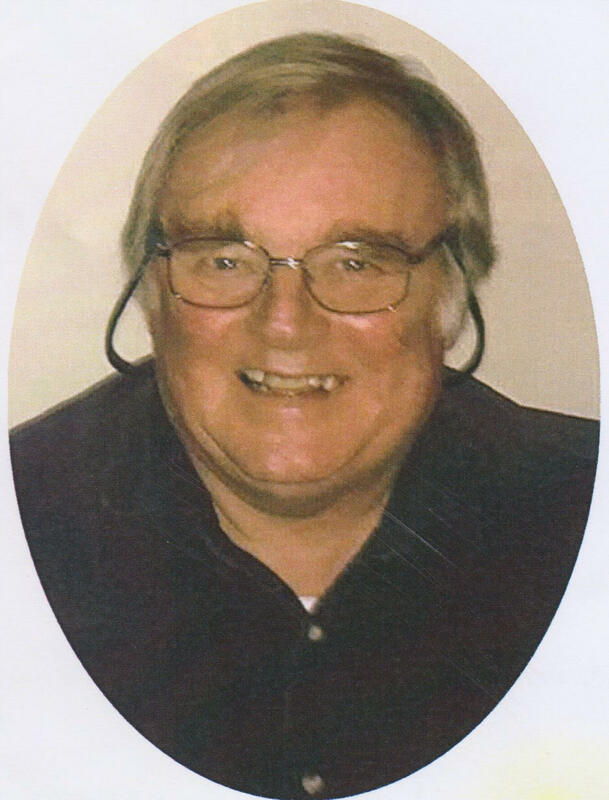 It was with great sadness that we learned of the sudden death of Godfrey Fairbairn who died at home on the 7 September 2018. Godfrey initially joined the West Lothian Twinning Association in the middle of the 70s’ as the EIS representative for West Lothian. Godfrey was a German teacher here in West Lothian and also for a few years in Germany and was the ideal candidate for the EIS on the Twinning Association. In 1987 Godfrey succeeded John Calder, the first secretary of the Twinning Association, and held this position for 16 years. During this time Godfrey was instrumental in successfully setting up partnerships/twinning arrangements between many clubs and organisations in West Lothian to visit the Hochsauerland and vice versa. At the same time many schools in West Lothian were partnered with schools in Hochsauerland. Also during this period thousands of people from both areas, mostly youngsters, travelled between the two countries. Godfrey’s input in ensuring contact was set up and facilitating the visits to ensure that the groups had an enjoyable and as positive an experience as possible in Germany cannot be over-estimated. Godfrey made a difference and will be remembered by many of these people. His humour will also be sadly missed on both sides of the twinning link. Godfrey is fondly remembered by many in the West Lothian Twinning Association and Hochsauerland Partnerschaft. We send our thoughts and condolences to Jean his wife, his children, Kristen and Michael, his grandchildren and all friends at this sad time. The HSK / West Lothian Strings project is one of the most successful reciprocal music exchange programmes WLC Instrumental Music Services has with our counterparts in HSK. From its inception we have had very positive exchanges involving students who are members of the West Lothian Schools Junior Strings Orchestra in Bathgate and Linlithgow clusters and through the Musikschule in HSK. It is a two-year programme : In year 1 students from Scotland travel to Germany to rehearse and perform with the students from the Musikschule in HSK. In year 2 the German students travel to West Lothian. The exchange takes place over the Pentecost weekend which is a church feast day and holiday in Germany. During the 4/5 day programme both Scottish and German students participate in workshops and rehearsals. The programme of music is agreed and rehearsed in advance with the students' own teachers. The exchange culminates in a final concert with an audience of parents and guests. One of the social highlights each year has become the Saturday evening ceilidh where both the German and Scottish staff perform live music and call the dancing. It is fantastic to experience the enthusiasm of the Scots who want to show their German counterparts our culture and the Germans who have the clinical dancing steps!! We include cultural visits in each year's programme which can include sightseeing in Edinburgh when in Scotland and the Mohnesee or Koln when in Germany. This is an educational experience for both sets of students who are usually first time visitors. The support of WLTA is really appreciated as we try to keep costs to a minimum for the students to allow access for all. We estimate that over the numerous exchanges some 750 young people will have appreciated this bonding experience with the Germans and many lifelong friendships have been formed. All staff who have been involved over the years have found it a very positive and beneficial experience. West Lothian Instrumental Music Service has extremely positive musical links with our twinning partners in Hochsauerlandkreis. Traditionally we have had projects involving our more established groups such as Brass Band, Jazz Band and Pipe Band. More recently the strings projects in HSK have developed and a recent addition within the Musikschule programme has been classical guitar tuition. This has resulted in opportunities for our guitar students to become involved in exchanges with our German friends. The German Guitar Exchange is a two-year programme with students from Scotland travelling to Germany in the first year and the hosting being reciprocated in year 2. The exchanges take place in June / July and are 4/5 day programmes where both sets of students participate together in workshops and rehearsals. The programme of music is agreed and rehearsed in advance with the students' own teachers, then during the exchange the students perform a number of concerts at various venues as well as visiting places of interest in Scotland or Germany. The support of WLTA is really appreciated as we try to keep costs to a minimum for the students to allow access for all. The Scottish guitar students can now appreciated this bonding experience with the German guitarists and many lifelong friendships have been formed. All staff who have been involved over the years have found it a very positive and beneficial experience. West Lothian International Youth Exchange has been going for some 46 years and is in place to develop links and friendships between young people in Scotland and in Germany. To share experiences and an understanding of each other's cultures. The German young people are all from Hochsauerlandkreis and the Scots from all parts of West Lothian. The youth exchange is a two-year programme with each group visiting in alternate summers, generally July in Germany and Scotland in the following August. Each year a programme is agreed in advance with the young people from both communities taking part in all the activities and staying together during the visit. In Germany the group stayed first in the youth hostel in Brilon then with the families of the Germans and finally in a hostel in Dusseldorf. This gives them the experience of rural, urban and family life in Germany. Highlights of this year's exchange included a visit to Winterberg Ski Jump and Winter Sports Centre where they learned about bobsleigh, ski jumping and luge. The music festival in Brilon, the climbing wall, Dusseldorf city walking tour , boat trip on the Rhine and many of the young people attended local festivals (similar to Gala Days) in the villages in which they were staying. In the recruitment this year we paid particular attention to the backgrounds of the young people and took into account the challenges they face, so we were able to include more young people from socially disadvantaged families and young people with socialising issues. In doing so we worked in partnership with Linlithgow Young People's Project, West Calder Community Centre and pupils support staff in Deans Community High School. West Lothian has tremendous musical and cultural links with our German partners. The town of Arnsberg was scheduled to reopen their town museum after extensive refurbishment and asked our West Lothian committee if they could send over some Scottish musicians to perform at the opening event on Friday 23rd August 2018. Gordon Connolly, Secretary of the Twinning Association, agreed to this request and a group of 5 attended and performed. The addition of a German saxophone quartet on the night playing Scottish tunes added to the atmosphere and ambience cementing the joint co-operation between our Counties. The event held in the grounds of the museum was very successful and attracted around 200 local people including members of the HSK twinning committee as well as groups who had visited West Lothian before e.g the choir who had been to Scotland in May 2017. Through our long established twinning links several sport and music groups have participated in one way visits or indeed reciprocal exchanges. In May of 2018 a bowling group from Arnsberg visited West Lothian and asked if we could assist them to participate in a game of Scottish Bowls on an outdoor bowling green (as opposed to the German Bowling Tradition -in a Kegelbahn- indoor bowling on a wooden bowling lane usually in a pub). Arrangements were made to accommodate the group at Lowport Centre, Linlithgow, and Jim Clark from the West Lothian Twinning Association made contact with the Balbardie Bowling Club in Bathgate who were more than happy to facilitate this request. Besides touring West Lothian/Edinburgh etc the highlight for the 12 man German bowling team was the Friday evening spent in May( with good weather )having an outdoor bowls competition on a splendid green in Bathgate. The event was professionally managed with pairs of Scots and Germans competing for a first Prize of £40 and a second of £20 followed by refreshments and a carry in of fish and chip suppers . A cultural sporting and dining experience very much appreciated by our German guests. A warm thankyou to the friendly Bathgate Bowlers who hosted them as well as a big thankyou to Jim Clark for organising arrangements and hospitality. Many of the events taking place currently with our twinning partners revolve around music and a regular request (given our constant reminder to them to experience haggis and whisky)was to host a Burns Supper for the Germans -in Germany!! On May 26th 2018 Haus Dickell in Meschede was the venue chosen by The HSK Twinning Committee supported by the staff of the HSK Musikschule to host the first Burns Supper of the HSK Association. Four Scots musicians /a Scots master of ceremonies and myself were in attendance and although I spent most of the evening on haggis cooking duty(with 2 gastronomie students) it was a fantastic, well-supported evening. The venue only allowed for 40 people to attend but their thirst for information regarding Burns and his music was phenomenal. Already the twinning members want to know the date of the 2nd Burns' Supper in 2019 but I have not yet responded as can't really soak in their enthusiasm for this type of event which we take very much for granted. No doubt there will be disappointment if we do not respond positively again so will approach West Lothian Committee to gauge support from our Scottish end and suggest our twinning association may also wish to attend. Vorlestag, Arnsberg, Hochsauerland. 15 - 18 November 2018. The group flew with Lufthansa from Edinburgh to Frankfurt on Thursday 15th November. On arrival they journeyed by train to Arnsberg. The journey was complicated by the necessity of taking three trains, each of which was delayed. This caused some stress among the group but ultimately they arrived in Arnsberg at 9.05pm. They were met by Sebastian Shuettler who accompanied them to the Hotel Alter Markt where they were comfortably accommodated for the duration of the visit. On Friday 17th November the group visited the Berufskolleg am Eichholz in Arnsberg where their return was warmly welcomed. As a result of the success of the previous visit, two extra classes were added for the readings. Mrs Gibson introduced and discussed some of the biographical details and the poetry of Robert Burns with particular focus on To a Mouse, To a Louse and Tam O'Shanter. Lauren Caskie and Elouise Urquhart read a variety of Scottish poetry including some by Liz Lochhead. 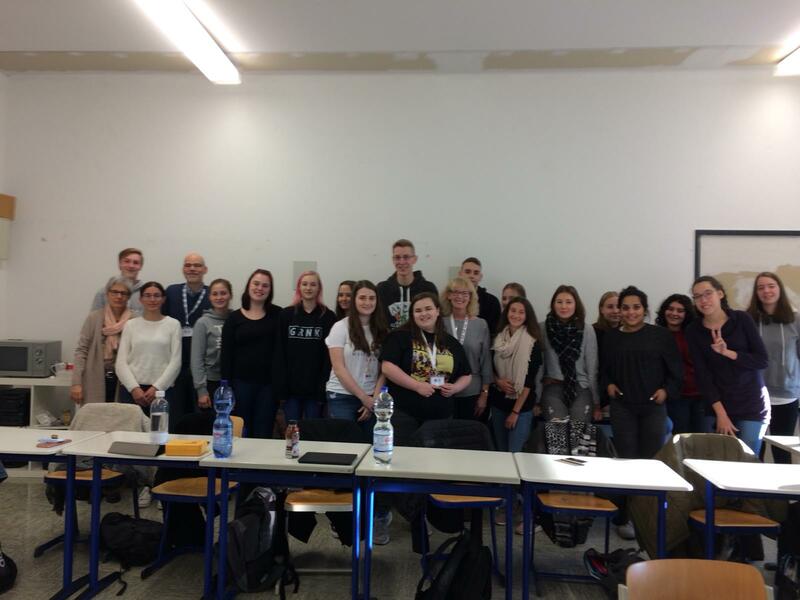 Mrs Caskie was taken by S Shuettler to another college for students with special needs where she spoke about Scottish culture and traditions and answered a range of questions (translated from German by S Shuettler) on general topics relating to Scotland. There was a public event in a room in the newly refurbished local station in the evening at which the group repeated the morning's performances. On Saturday afternoon Sebastian Shuettler led a very interesting tour of the old church and associated buildings. On Sunday 19th November the group returned to Frankfurt by train which involved no less than six changes of train, this as a result of trains splitting at various destinations. The flight to Edinburgh was uneventful and on time. Much appreciation and thanks is due To Sebastian Shuettler for his tireless efforts to organise the trip in the Hochsauerland and to entertain the group in the course of the visit. The trip was a great success resulting in a request for a return to the Berufskolleg next year. It should be noted that, as a result of the success of the previous year's visit, the former Head Teacher came to the college to meet the West Lothian group and the Deputy Head teacher presented us with a 10th anniversary publication of writing and artwork produced by their students. In addition, one of the staff has requested a particular format for his students for next year, yet another indicator of success and the importance of the connection in the Twinning Organisation.